To faithful members of various congregations across numerous denominations, the symbol of the church pew is more than just a place to sit during Sunday worship services; the church pews are a symbol of something so much more. In fact, many Roman Catholic, Lutheran, and Episcopal churches remain devoted to the iconic pews, that date back nearly 500 years. Nowadays, in the evolving, diverse religious communities, traditional pews are starting to become a thing of the past, while newer styles of seating and worshiping are inspiring churches to replaces pews with new, contemporary forms of seating. Depending on the congregation, when it is time to upgrade pews, churches are opting for folding chairs or theater style seating instead of iconic pews. While this is not true for every church, more and more congregations are making this transition. Other congregations are committed to keeping pews as a part of their worship service, replacing old pews with newer ones when needed. But, this then raises the question of what to do with the old pews? 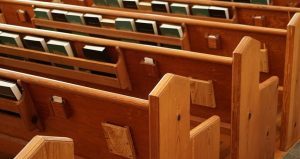 Many congregations will sell their old pews that they no longer have any need for, while others desire for their old pews to remain in service for another congregation. Many faithful followers of various denominations believe that pews belong as part of a church, and not in individual’s basements or restaurants. The latest trend in modern churches is more and more congregations are making the transition to chairs. Some believe that this transition is a result of the burden that the cost of new pews places on churches. Add on top of the cost of purchasing new pews, the cost of a new church building, and the cost can be substantial. More and more modern churches, are opting to build a multi-purpose building, where chairs can be easily moved—creating a worship area, or a community gathering place. For congregations who are devoted to sticking with the traditional icon of a church pew for Sunday worship, Born Again Pews offers affordable alternatives. Reviving used pews, and restoring them to a like-new condition, Born Again Pews is able to provide quality church furniture that is affordable, maintaining respect and spirituality that many worshipers associate with church pews.